Over a decade ago, researchers like Mari Gallagher asserted that “food deserts” were literally killing Chicagoans—mostly low-income African-Americans living across the South and West Sides. IMAN has galvanized its unique position to work toward a grassroots solution to this crisis. 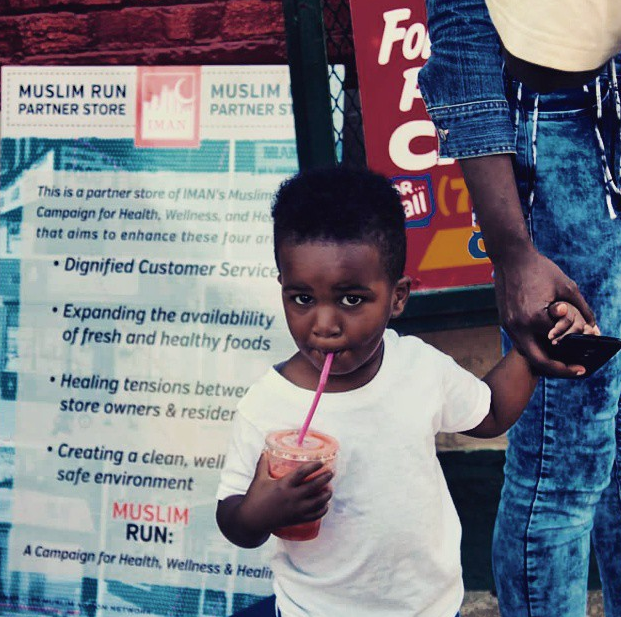 The Muslim Run campaign addresses the highly problematic business practices of these stores, as well as the gaping lack of community access to healthy foods and wellness education. This past year, the City of Chicago identified IMAN’s work on this issue as a model. To date, the Muslim Run team has logged thousands of hours engaging residents, corner store owners, politicians and community leaders; built a network of 33 partnering corner stores across the South and West Sides; opened up a unique farmers’ market; and has begun establishing a replicable “corner store conversion” model we have presented across the country. Our vision for this work is greater than confronting the grim realities about life expectancy and fresh food access in the inner-city. Ultimately, as with all our work, we’re striving to demonstrate the transformative impact united communities can have by organizing for change at the grassroots level. Please do all you can during these last days of Ramadan to make your tax-deductible and zakat-eligible donations to IMAN. This entry was posted in Direct Services, One Chicago, Organizing & Advocacy and tagged Ramadan by IMAN Staff. Bookmark the permalink.